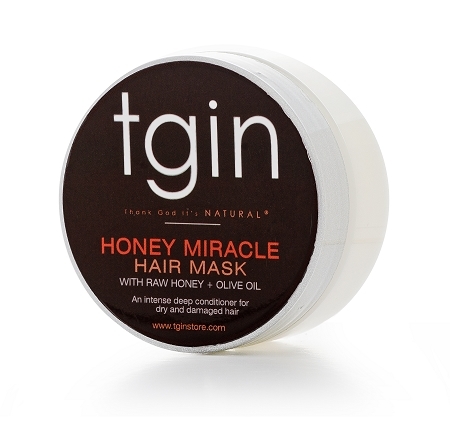 Directions: After shampooing with tgin Moisture Rich Shampoo, and conditioning with tgin Triple Moisture Replenishing Conditioner, apply a generous amount of tgin Honey Miracle Hair Mask to hair and comb through to ensure thorough distribution from roots to ends. Place a plastic cap over hair and sit under dryer for 10-15 minutes or leave on the hair for 35 minutes to 1 hour without heat. Rinse thoroughly with warm water, followed by cool water. I used this product yesterday, and I swear I heard my hair shout "Woo Hoo!!!" LOVE this stuff. I've tried a lot of deep conditioners. None even come close! Loving the slip! I usually finger detangle, but was in a rush and used my wide tooth comb instead while in the shower. And seriously the shortest detangling time ever!!! I sectioned my hair off, applied the product to each section and then after full application, went back and detangled each section after letting it sit for a couple of minutes. Super moisturizing just like it says and smells SO GOOD It’s a coconutty scent and I love that it’s not too sweet smelling like those products that smell like cake but it still leaves your hair smelling nice. Kudos to a moisturizing product actually doing everything it says it will!